Can I replace the apple with something more exotic from Asia and have that statement still be true? I hope so, because one of my favorite things when I visit a foreign country is checking out their exotic fruits. I know Asia has a lot of weird things like cuddle rooms in Japan, stinky tofu in Taiwan, and numerous of weird inventions that have us all say “what the…” However, trust me when I say this — weird looking fruits are gifts from Mother Earth! I’ve seen a white dragon fruit, but I’ve never seen it in red before in my life. The appearance of this fruit can be daunting for first timers but don’t let it scare you away. The flesh is soft and refreshing especially if you refrigerate it before eating. The flavor is mild and like a watermelon, it doesn’t have a strong definitive taste — it only have a minor flavor profile hinting you that it’s a dragon fruit. Do give this fruit a try because I bet you will fall in love with it. 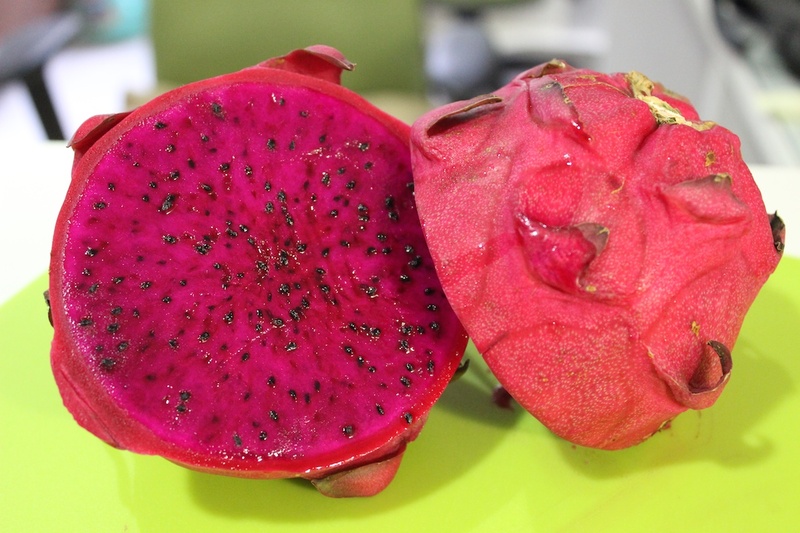 Personally, the red dragon fruit is a tad sweeter than its white flesh counterpart. Did a lemon have sexual relations with an orange to bear this green orange as its fruits of labor — Get it? 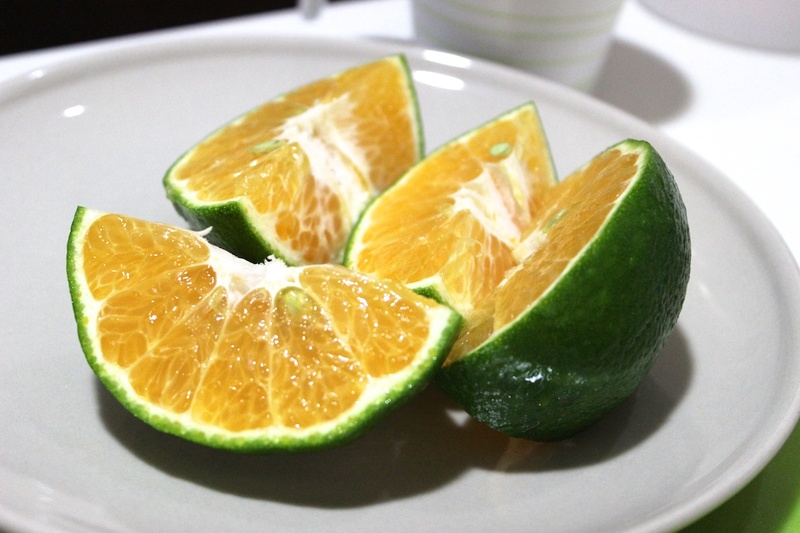 I know I’m lame… It looks sour or not yet ripe, but for this type of orange, green means ripe and ready to eat. It’s easy to peel, sweet, and very juicy! 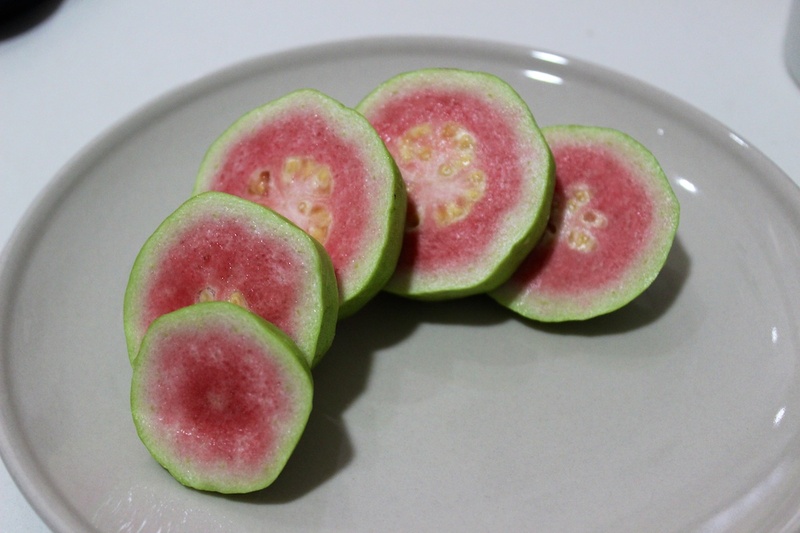 Pink Guava — doesn’t it look too beautiful to eat? Thank god my stomach is stronger than my eyes because I nom, nom, nom’ed it. Unlike the white guava, the flesh is softer and less crunchy, but it’s just as good. Maybe it’s the Vietnamese in me, because whenever I eat guava, I have to dip it in chili salt. It elevates the fruit to another dimension with a perfect balance of saltiness, sweetness, and spiciness. You can make this simple chili salt by grinding 1 thai chili pepper into a 3-4 tablespoon of regular salt (big sea salt will not work). Caution: the finer you grind the chili pepper, the spicier it gets, so adjust it to your taste. You can enjoy this chili salt with, but not limited to, pineapples, watermelons, guavas, and especially with fruits that are not really sweet. The salt brings more of the sweetness out. 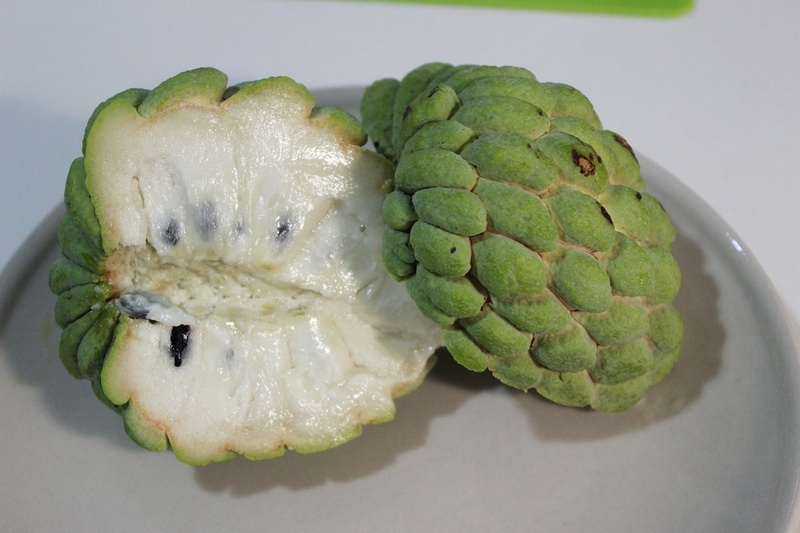 Custard Apple: To me, the fruit looks like a tortoise shell, like I can totally see a head and legs sticking out of it. Unlike a tortoise’s shell, the outer skin of this fruit is soft and thin. The flesh is a little bit grainy, but it is super sweet and delicious. One annoying thing about eating this is the amount of big seeds you have to spit out. To make it worth eating, I suggests setting aside 2-3 fruits per person so you can truly enjoy it. 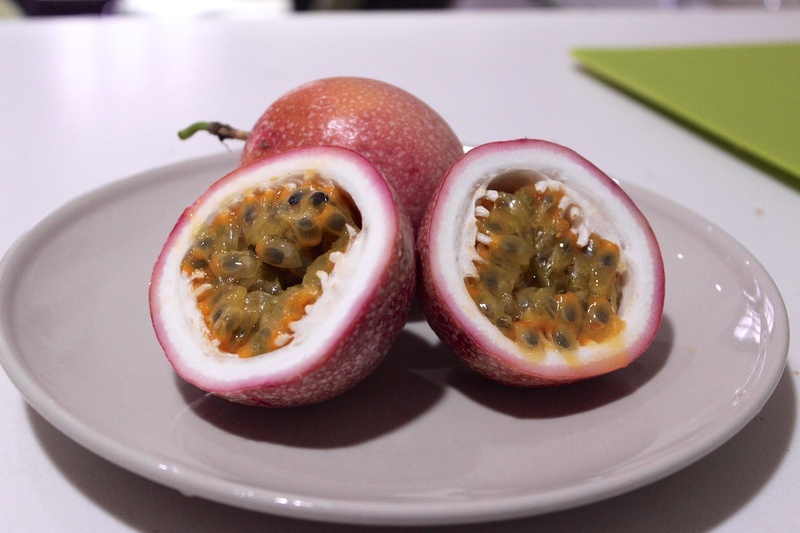 Passion Fruit: My 2010 visit to Vietnam was the first time I have ever had passion fruit in its true fruit form and not as an artificial flavor and I instantly fell in love. I was taught by my uncle then to scrape the yellow flesh out (seeds included) in to a cup filled with water and dilute 1 or 2 teaspoons of sugar and drink it. It is the most refreshing and exquisite drink you’ll ever taste. This time around, I got too excited that I didn’t even have a chance to turn it into a drink, I just ate it with a spoon right out of the fruit. I know this fruit looks like a monster with many eyes and teeth, but if I can leave you with just one lesson — the scarier looking the fruit, the more treasures it holds. So don’t deprive your taste buds or yourself from amazing and scary-looking fruits!